ROYAL CANIN Medium Adult 7+ Dry Dog Food is both scrummy and nutritious! ROYAL CANIN Medium Adult 7+ contains an adapted content of nutrients to help maintain vitality in medium breed dogs like yours that are facing the first signs of ageing. What’s more, ROYAL CANIN Medium Adult 7+ contains an exclusive complex of antioxidants to help neutralise free radicals and to help maintain the condition of vital molecules in your dog’s body. ROYAL CANIN Medium Adult 7+ helps to support optimal digestibility with an exclusive formula of nutrients, including a balanced supply of dietary fibre and an optimal amount of very high quality protein. Additionally, ROYAL CANIN Medium Adult 7+ is enriched with fatty acids EPA and DHA – these help to help support your dog’s skin health, as well as an ideal coat condition. 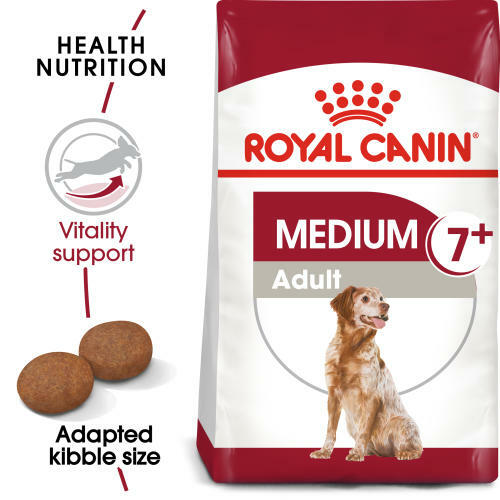 To cater to each dog’s individual preferences, ROYAL CANIN Medium Adult 7+ is also available as wet food in delicious gravy. If you’re considering mixed feeding, simply follow our feeding guidelines to ensure your dog gets an accurate amount of both wet and dry food for optimal benefit. Vitality support - Adapted content of nutrients to help maintain vitality in medium breed dogs facing the first signs of ageing. Contains an exclusive complex of antioxidants to help neutralise free radicals. High digestibility - Helps promote optimal digestibility with an exclusive formula including very high quality protein and a balanced supply of dietary fibre. Additives: Vitamin A: 22000 IU, Vitamin D3: 1000 IU, E1 (Iron): 43 mg, E2 (Iodine): 4.3 mg, E4 (Copper): 13 mg, E5 (Manganese): 56 mg, E6 (Zinc): 134 mg, E8 (Selenium): 0.07 mg - Sensory additives: tea extract (source of polyphenols): 150 mg - Preservatives - Antioxidants. * L.I.P. : protein selected for its very high digestibility. Composition: Dehydrated poultry protein, rice, maize, wheat flour, animal fats, maize flour, vegetable protein isolate*, wheat, beet pulp, hydrolysed animal proteins, fish oil, minerals, soya oil, yeasts and parts thereof, psyllium husks and seeds, fructo-oligo-saccharides, hydrolysed yeast (source of manno-oligosaccharides), borage oil, marigold extract (source of lutein). Crude ash: 5.2%. Crude fibre: 1.6%. Crude oil fats: 14%. Moisture: 0%. Protein: 25%.